The 8 Components of E.S.T.E.A.M. E. S. T. E. A. M.
The E.S.T.E.A.M. Initiative is an organization created to spread awareness of the power that STEM+the Arts have when they are combined. In fact, the acronym E.S.T.E.A.M. stands for Empowerment through Science, Technology, Engineering, the Arts, and Mathematics (STEAM). The organization's motto is "Changing Lives through the Arts & Sciences... One Kid at a Time." convince kids through real-life interaction that "Smart is Cool"
E.S.T.E.A.M. fulfills its mission in three tangible ways: through its own grassroots outreach programs, volunteer involvement and by establishing organizational partnerships. Grassroots eff﻿orts include the E.S.T.E.A.M. Backpack Program, book donations, school/program on-site visits, a scholarship for at least one graduating high school senior, and more. There are two groups of volunteers: the appointed E.S.T.E.A.M. Advisory Board and the STEAM Team, our active volunteers. E.S.T.E.A.M. also seeks to build and sustain nationwide partnerships with schools, businesses, colleges, universities, arts organizations, professional associations, and youth-service agencies. The purpose: To expose as many students as possible-- especially girls, boys-of-color, those in-need or at-risk, and others traditionally under-represented in STEAM careers-- to meaningful educational experiences in these fields. The E.S.T.E.A.M. partnerships become official when a potential partner pledges to start or continue doing at least one or more actions related to The 9 Components of E.S.T.E.A.M. After Taking the Pledge, the new Partner is connected by E.S.T.E.A.M. to one or more existing partners so they can build their own alliance, joining forces to make a difference for our children. Click here to Take the Pledge. Click here to go to the E.S.T.E.A.M. Partnerships Page. Our organization is offering its 2018 Barbara Hinton Bragg Memorial Scholarship. It is named in memory of E.S.T.E.A.M. founder Malerie Gamblin's grandmother and is back after its inaugural year. The scholarship is again available to high school seniors affiliated with E.S.T.E.A.M. partner schools or organizations. Also invited to apply are current community college students with plans in place to transfer to four-year institutions. Deadline for submission: Emailed by March 30th. Click here for the application. Congratulations are in order for Kaysie Justice, a student at Long Reach High School in Howard County, MD. This graduating senior is the 2017 recipient of The E.S.T.E.A.M. Initiative Barbara Hinton Bragg Memorial Scholarship. Kaysie's achievements in the classroom, with the school chamber choir and elsewhere are exemplary and E.S.T.E.A.M. is pleased to have selected her. "My mother would have been very, very proud of this young lady" said Ellicia Chau, Mrs. Bragg's daughter and E.S.T.E.A.M. Scholarship Committee chair. All the best to Kaysie, our 2017 recipient! Our organization is offering its 2017 Barbara Hinton Bragg Memorial Scholarship. It is named in memory of E.S.T.E.A.M. founder Malerie Gamblin's grandmother and is back after its inaugural year. Recently, E.S.T.E.A.M. 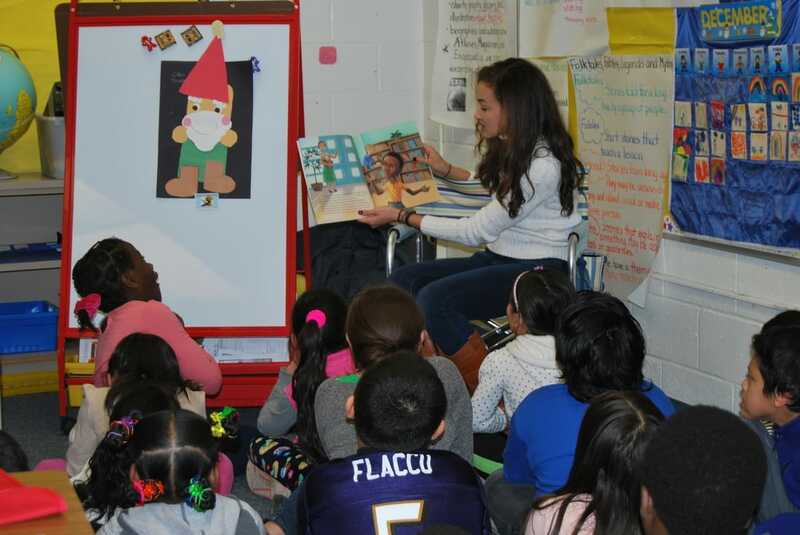 Founder Malerie Gamblin made a special trip to one of our partner schools, Swansfield Elementary. 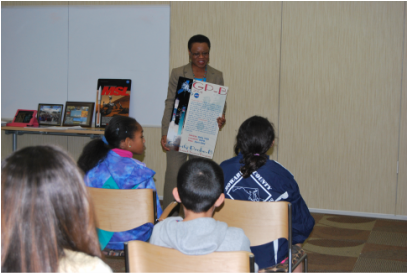 She went to the BSAP Afterschool Program to do a space-related storytime. She read Mousetronaut Goes to Mars by astronaut Mark Kelly and Ron's Big Mission (about Space Shuttle astronaut Ronald McNair) by Corinne J. Naden and Rose Blue. She also went there to tell the students about a very special movie coming out on December 25th called "Hidden Figures." Set in the early 1950s, it is the true life story of Mary Jackson, Katherine Johnson and Dorothy Vaughn. ​The three were women and African American and they worked in the segregated South for NASA. They were extraordinarily gifted mathematicians, known as "Human Computers," whose calculations sent astronauts Alan Shepard and John Glenn into orbit and back. At the end of the afternoon, Malerie did a prize drawing, assisted by volunteer Mr. Walsh. The runner-up received a new hardcover copy of Mousetronaut and the first-place winner won two tickets to see "Hidden Figures." E.S.T.E.A.M. encourages everyone to go to the movie theater to see this amazing history come to life! For the third year in a row, The E.S.T.E.A.M. Initiative has again donated backpacks to one of its school partners, Seaton Elemen-tary School in Washington, DC. Each backpack presented to school principal, Ms. Kim Jackson, was gender-specific and age-appropriate. E.S.T.E.A.M. founder Malerie Gamblin is especially glad to continue assisting Seaton because her late grandmother, Mrs. Barbara H. Bragg, was the school's library-media specialist for years. "Grandma would be really proud of what we're doing," Malerie said. Know a middle school student who might want a mentor at NASA? Suggest they apply for NASA GIRLS and BOYS program. Click here for the application. Good luck! ​Congratulations are in order for Aurora, IL high school senior, Miss Morgan Harris. She is the 2016 recipient of The E.S.T.E.A.M. Initiative's Barbara Hinton Bragg Memorial Scholarship. E.S.T.E.A.M. sent applications to our partners nationwide. Through our partnership with the Girl Scout Council of Greater Chicago & Northwest Indiana (GSGCNWI), we are pleased to have selected this year's winner. ​"Morgan's achievements in the classroom, music room, engineering lab, in girl scouting, and more are truly outstanding," said E.S.T.E.A.M. founder, Malerie Gamblin. "We wish her all the best in college and beyond! Our organization is offering its 2016 Barbara Hinton Bragg Memorial Scholarship. It is named in memory of E.S.T.E.A.M. founder Malerie Gamblin's grandmother and is back after its inaugural year. ​Mr. Giles Bragg, Sr., E.S.T.E.A.M. 's honorary chairman and grandfather of organization founder, Malerie Gamblin, died December 11th at the age of 85. He was a retired academic and music educator. Former students from the early 1960s through the early 2000s attended his funeral. Instrumental and choral music were integral to the service, from the church choir to over 50 of his Omega Psi Phi brothers singing their fraternity hymn to a U.S. Army bugler playing "Taps" at his gravesite. "Pop-Pop gave me the gift of music," Malerie said. "He had a huge impact on my life and I will always be grateful to him." In addition to his family, Mr. Bragg (in above photo) was also an inspiration to many students. For over five decades, he taught, mentored and volunteered with young people, continuing the legacy of his band teacher who, in 1939, reached-out to him with a trombone in her hand. The E.S.T.E.A.M. Initiative extends its sincerest thanks for all Mr. Bragg did for our organization and for music education. He will be missed. The E.S.T.E.A.M. Initiative continues to demonstrate its commitment to education by again donating backpacks to one of its school partners. This fall's recipient: Sea-ton Elementary School in Washington, DC. E.S.T.E.A.M. founder Malerie Gamblin has a special connection to Seaton: Her grandmother, Mrs. Barbara H. Bragg, worked at the school for years as its library-media specialist. "Seaton is a great school," Malerie said. "My grandmother would be really glad that we have found a way to honor her and help the kids with backpacks at the same time." Each backpack was gender-specific and age-appropriate. ​"We loved getting backpacks again this year," said the school's principal, Kim Jackson. "Your thoughtfulness,"she added, "is much appreciated." The E.S.T.E.A.M. Initiative has selected its first Legacy Award recipient: U.S. Army Col. George Kyle, M.D. (pictured above with E.S.T.E.A.M. founder and executive director, Malerie Gamblin, at the June 7th award presentation). Dr. Kyle, ﻿who is also a member of the E.S.T.E.A.M. Advisory Board, was recognized for being a credit to his parents and the teachers who educated him; and for his devotion to family; his service to country; and, his willingness to volunteer. He truly values education and, by setting an example, is an extraordinary inspiration to young people. Dr. Kyle's legacy will endure today and always. Congratulations to our 2015 Legacy Award winner! The Barbara Hinton Bragg Memorial Scholarship was awarded to graduating high school senior, Brittany Nixon. E.S.T.E.A.M. received applications from several outstanding young scholars. However, it was Brittany's academic achievement and community service-- combined with her vast participation in STEM and both the fine and performing arts-- that impressed the Scholarship Committee so much that it selected her unanimously. "My grandmother [Mrs. Bragg], would have been really proud of Brittany," said E.S.T.E.A.M. founder Malerie Gamblin. "When I tell people why this scholarship would have been so important to her, I say three things. "First, she believed that every young person has potential and she took action to help them achieve it. "Second, even though Grandma grew-up in the segregated South where, in many places, Black people couldn't even borrow library books, she never labeled people by their color. "Third, Grandma believed that 'Education is Everything.' She taught her children, grandchildren and students lessons about all three of these things." So, it is in her memory that the inaugural Barbara Hinton Bragg Memorial Scholarship is awarded. Congratulations, Brittany! For more information, scroll-down to article below. To apply before the May 9th deadline, Click here. Ballet Beginnings: An Introduction for Young Dancers was created by The E.S.T.E.A.M. Initiative in partnership with Girl Scouts of Central Maryland (GSCM). Taught in the dance studio of the GSCM Urban STEM Center, the pilot program was a three-day intensive that introduced the this performing art to children ages 8 to 12. The students learned the fundamentals of classical ballet, a brief history of ballet and about the science of dance. "My favorite thing was learning the science of dance," wrote one of the 5th graders. "It was interesting because I did not know that science was in dance." What a wonder way to express the power that STEM and the performing arts have when they are combined! Click here to read more. E.S.T.E.A.M. is offering its 2015 Barbara Hinton Bragg Memorial Scholarship. The scholarship is named in memory of Malerie's grandmother, Mrs. Bragg. She was a life-long teacher who wanted people young and old to understand that "Education is Everything." High school seniors affiliated with E.S.T.E.A.M. partner schools or organizations as well as current community college students (planning to transfer to a four-year institution) are invited to apply for the scholarship. Deadline for submission: Applications must be postmarked by May 9th. To download a copy of the application, Click here. Recently, the kids of Howard County Schools' Black Student Achievement Program (BSAP) got a visit from a very special guest. 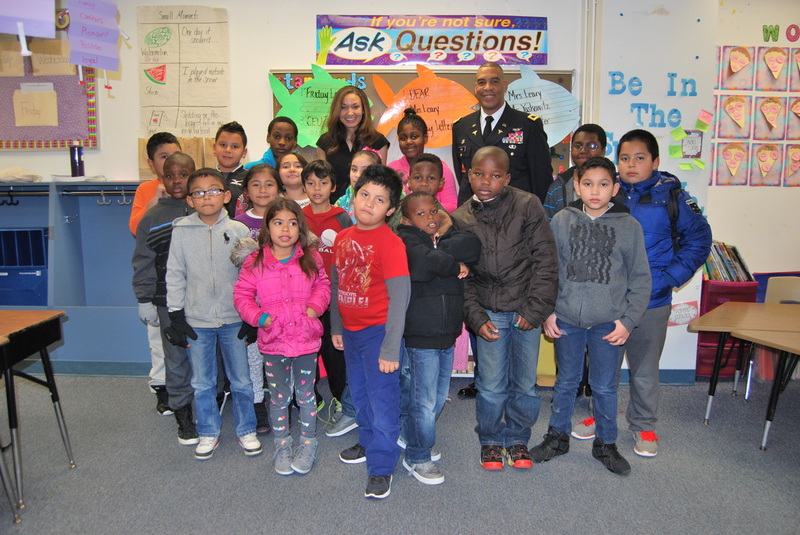 Col. George Kyle spoke at BSAP's Swansfield Community-based Learning Center about growing up, going to school and dreaming big. Col. Kyle is also known as Dr. Kyle. He is an active-duty U.S. Army officer who is also a medical doctor. Click here to read more. After graduating from the United States Military Academy (also called West Point), then-Lt. Kyle decided to become a pilot. He flew helicopters for six years, then went to medical school. The BSAP kids had lots of questions, including how long he went to school, his favorite place to live and what it was like being in combat. The students found Col. Kyle's life story truly inspirational. They seemed parti-cularly interested in his unique path to medicine, to flying helicopters and how his parents taught him how to make a reality out of dreaming big. In early November, E.S.T.E.A.M. presented a program called "The Sky's the Limit: Women in STEM Careers." The guest speaker was Ms. Wanda J. Harding. She is an electrical engineer who currently works for the National Oceanic Atmospheric Agency (NOAA)'s Joint Polar Satellite System (JPSS) and used to work for NASA. As a college student at Virginia's Hampton University, she devoted herself to becoming an engineer. At first, Ms. Harding, who grew-up in Florida near Disneyworld, considered a career engineering and designing amusement park rides. Eventually, after earning her master's degree from Georgia Tech, she began working as a Senior Mission Specialist at Kennedy Space Flight Center. She was part of the team that launched NASA space shuttles! 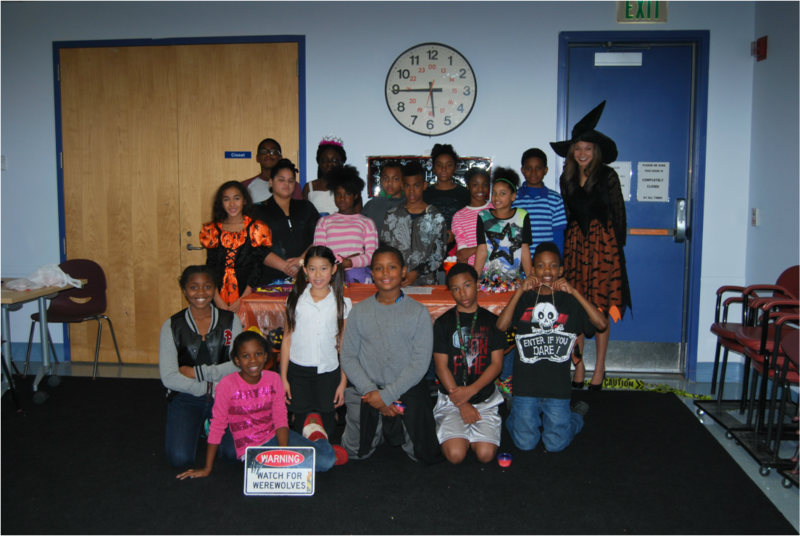 There were no tricks only treats with our outreach program, WEIRD SCIENCE: an E.S.T.E.A.M. Halloween! Earlier this week, Malerie and three STEAM Team volunteers visited a library afterschool program in Howard County, Maryland. Their mission: To teach the 5th to 8th graders about biology and chemistry through fun, hands-on activities. First, the kids had a contest to learn about the human skeletal system. After that, they were introduced to chemical reactions by making slime. Their last activity was really sweet! They learned about cell structure by creating edible plant cells with Halloween candy. Mitochondria, nuclei and cytoplasm never tasted so good! The afternoon ended with the kids getting goody bags and dancing. What's a Halloween-themed program without Michael Jackson's "Thriller"? The E.S.T.E.A.M. network is growing. To establish more partnerships nationwide partnerships, Malerie recently journeyed to Central Texas. While in Houston, TX, Malerie met with a global chemical company. Later that day, she visited a high school just north of downtown Houston and sat-in on its mariachi band. Malerie then traveled about two hours away to Austin where she went to the nationally-renowned Ballet Afrique academy. ﻿Click here to read more. One of E.S.T.E.A.M. 's most active partners is Big Brothers-Big Sisters of the National Capital Area (BBBSNCA). One of the Washington, DC-area's leading non-profit organizations, its mission is to match children ("Littles") from father or mother-absent homes with mentors ("Bigs"). In addition to traditional one-to-one matching, BBBSNCA also reaches-out to children through its school-based programs. Sometimes, the Littles go on field trips like this recent one to American University for which Malerie (in above photo, second from left) was a chaperone. Click here to read more. Malerie is a young lady on a mission. In her continued effort to create greater aware- ness of the power of STEAM, she recently visited Chicago, IL. There, two partnerships were formed with E.S.T.E.A.M. : the Legacy Public Charter School and the Girl Scout Council of Greater Chicago and Northwest Indiana. This will be exciting! Through the generosity of its new partner, the Junior Tennis Champions Center (JTCC), E.S.T.E.A.M. will host its first tennis benefit. Proceeds will go to E.S.T.E.A.M. 's Barbara Hinton Bragg Memorial Scholarship Fund. Washington, DC. Click here to read more. and school supplies can be a hardship. Program comes in. Click to read more.